Trademarked design and functionality for meat and sausage production. Save time and energy and set free resources during the production but at the same time be sure to have a constant quality results. Why do you need MProS? In meat and sausage production, MPros tool offers a significant added value in terms of time and energy savings and supports the optional validation. 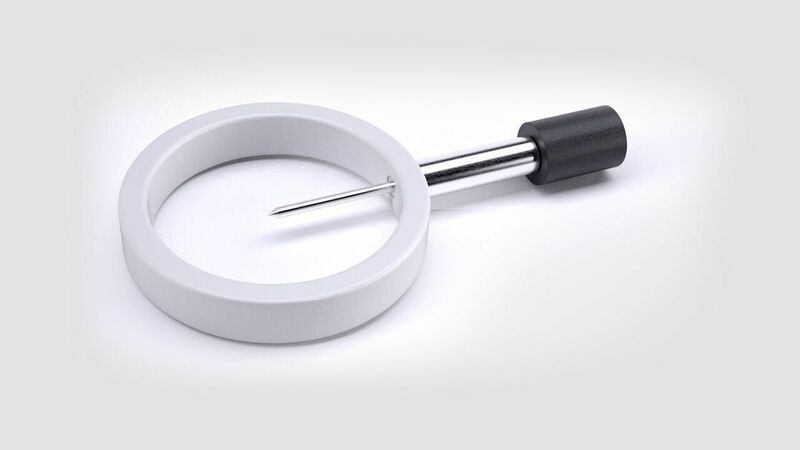 MProS trademark registered tool consists of a plastic ring with metal sleeve and ensures that the core temperature of your product can be measured precisely in the center of the product. MProS is available worldwide. The product can be adapted individually to every existing casing size. Please contact us for your individual requirements. You can, of course, contact us personally at any time in order to clarify your individual questions or to consider your existing production processes and framework conditions. MProS is for all companies involved in meat and sausage production. MProS is mainly suitable for the production of round sausage products in the current state, further fields of application are in process of developement. With its synthetic ring and the metal sleeve, MPros ensures that the PT100 “temperature probes” used in your production process are placed exactly at the core of the product. Due to the precisely placement in the core, time and energy can be saved during the cooking process. In addition, MProS supports the validation process of the production.